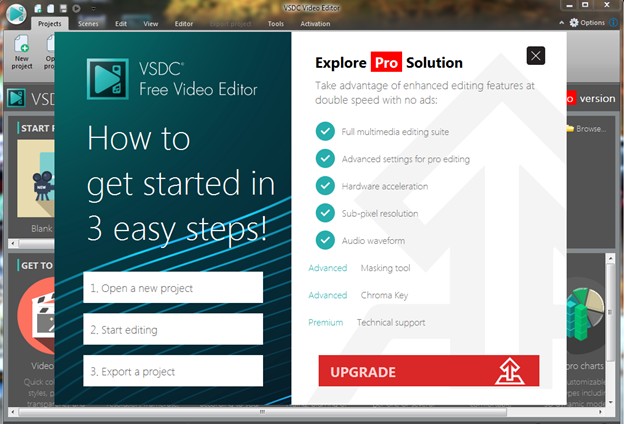 What is VSDC Free Video Editor? Video editing has long been a thing for professional film makers. But with video editing software, even an amateur can add some pretty awesome effects and transform a boring clip to a viral video. Whether you are a beginner or pro, you want video editing tool that is easy to use and packed with basic and advanced video editing features. One such tool is VSDC Free Video Editor. VSDC Free Video Editor is a non-linear video editing software developed by Flash-Integro LLC. It is a surprisingly feature rich software, considering it is free. It does not come bundled with other apps, neither does it display any ads. The only pop-up you will ever see is the occasional prompt to upgrade to a new version. With this software you can edit and customize video clips, audio files, and even images. The software outputs video with quality as high as Full HD, with a frame rate of 30fps. It allows you to import a wide range of video formats and codecs, including the common ones such as MP4 and AVI as well as some unconventional formats such as RM and SWF. There are preset video editing effects such as masking, color correction, blending, and Instagram-like filters. These effects allow blurring and hiding elements in a video as well as add shapes and subtitles to your videos. It has an inbuilt screen recording tool, which can come in handy when creating tutorial videos and presentations. Also, it has a disc burner tool that allows you to easily burn the output file to a DVD, which is very rare in free video editors. Also the pop up has link to upgrade to the pro version. The pro version has hardware acceleration and more advanced editing tools. After cancelling the pop-up, the Projects tab opens. You have the options to create a new project, open an existing project. To start a new project, you can choose a blank project, create a slideshow, import content, video capture, or screen capture. You are probably looking to cut and trim video or combine several clips. So, you should click on Import content. At first, you will only be able to import one file. You can import more content later. After selecting the file you want to open, a project settings dialogue box opens. Set the different parameters on the dialogue box and click finish. After that you will the Editor tab opens. Here you can add objects and video and audio effects to the imported file. You can cut, split, and rotate the video too. In other words, this is where the magic happens. You can preview the output video before exporting. After doing the editing, go to the Export tab and select your preferred format. Clearly, VSDC free video editor has a beautiful and intuitive user interface. You will enjoy the experience, and finish your video edit in no time. 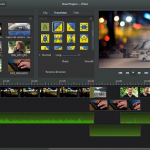 These are the features that make this software the best free video editor. The software uses the non-linear video editing technology. In linear editing, scenes follow each other in a specified sequence, but nonlinear editing allows placing scenes in any position on the timeline. You can change the position, size, and transition of different scenes randomly. There are dozens of video and audio effects. These preset effects allow quick editing of video files. You can also combine different effects to create a custom effect. Read more on the visual and audio effects in the Effect package section below. Video editing often involves changing the color blending in the video. Nothing does that better than Instagram filters. The app also has more color blending features available such as grayscale, auto levels, contrast, temperature, and blur. You can apply any of these filters in one click. Another important feature in any video editing tool is masking. There are elements in a video, such as water marks, which you want to remove. Another common reason to use masking is to protect the identity of a person in a video. With this app, you can do this by using shapes to hide the unwanted elements or using the blur effects. The software positions objects in a scene and video with subpixel accuracy. That way, the image quality is maintained even after rotation, skewing, or application of any other visual effects. The number of video and audio input and output formats this software supports is overwhelming. This feature eliminates the need to first convert a file to a popular format, as would be required when using software that does not support a video format you want to edit. 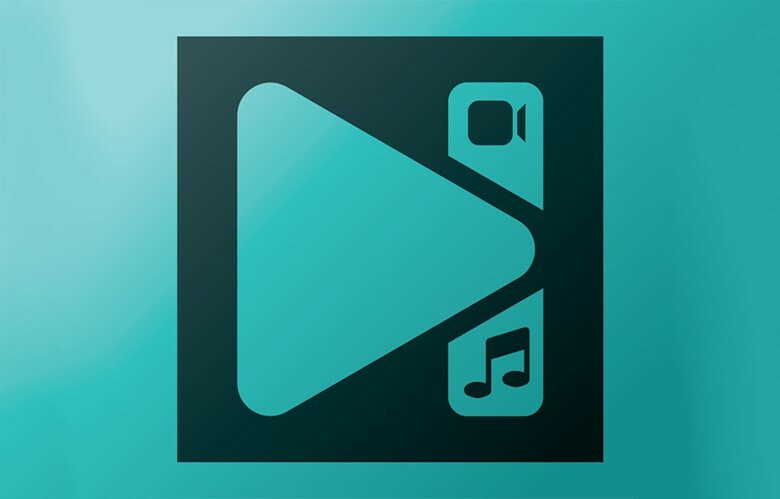 The app not only supports a huge number of formats, but also creates videos that are compatible with popular media players such as iPods, Xbox, Play Station, and Zune. 3D charts and diagrams are among the many shapes and objects you can create with this app. You can create a bar, or stacked bar, a pie or 3D pie, a scatter line, a pyramid, a point, a funnel and much more. This feature helps create professional presentation videos, which are more versatile compared to slides. YouTube is the most popular online video sharing site. It makes sense that you would like to edit a video then upload it on the site. So, the developers included a YouTube uploader tool to directly share videos on the site. It is time saving and easy to use. The YouTube uploader is located in the Tools bar, alongside the other tools discussed below. This is an inbuilt application that can convert videos from one format to another. It can also split videos into different sections, and also merge different video files into one file. The DVD burning tool makes it easy to burn the final video to a DVD in the optical drive. Often, videos taken by smartphones, moving cameras, and drone cameras are shaky. The video stabilization tool improves such videos by removing the shaky effects and jitter resulting in a smooth video. The screen capture tool records activity on the monitor. You can then edit the resulting footage in the editor. This feature facilitates creation of professional video tutorials. The video capturing tool enables the software to record footage from cameras connected to your PC such as webcams and IP cameras. 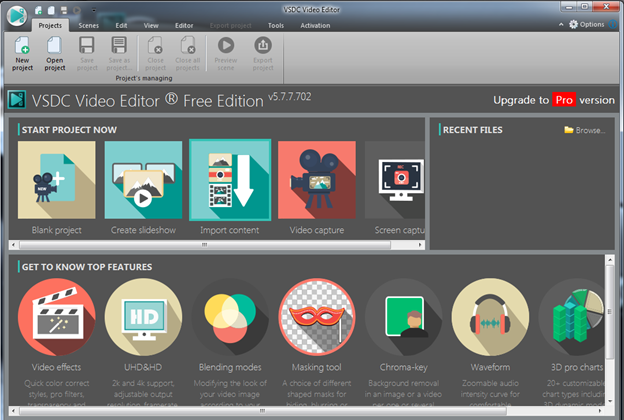 The resulting footage is saved and can be edited in this video editor. There are lots of video and audio effects, especially considering it is a free tool. Under Video effects, there are Quick styles that allow adding effects such as grayscale, contrast, blur, image sharpening, and adding Instagram effects such as hefe, lily, inkwell, and toaster. Under Adjustments you can add or alter the bit resolution, hue/saturation, sepia, color twist, negative, sepia, and many other adjustments. The Filter section has things like box blur, motion, blur, oil paint, median, wiener, and others. You can also perform some Transforms such as flip, rotate, skew, shift, and mirror. The Transitions include chess, wipe, fade, diffuse, page turn, and mosaic. 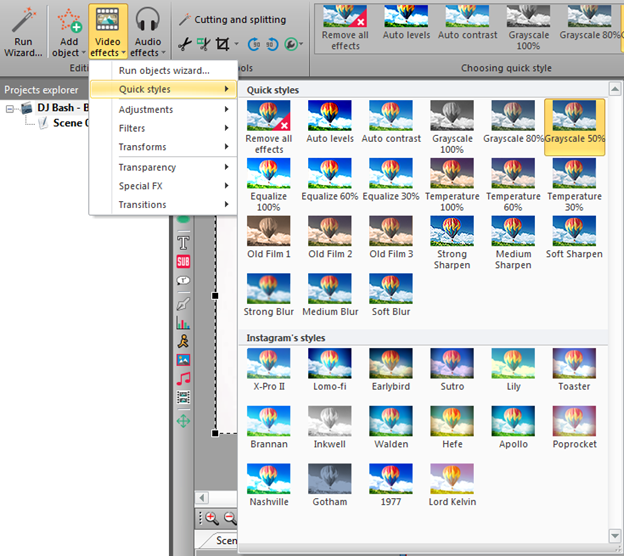 Transparency options include fade in and fade out, make opaque and make transparent, borders, and background remover. VSDC also has some Special FX that enable you to add smoke, fire, water, plasma, and TV to the videos. The Audio effects are Amplitude effects (such as fade in/out, silence and amplify), Delay effects (such as flanger, reverb, chorus), Filter effects (such as notch, highpass, lowpass, peaking EQ), Time stretch or Pitch shift, and a Special reverse effect. The rendering speed of VSDC is, of course, dependent on your computer’s hardware. It is not the best at rendering speed, but it is not at the bottom either. Pro users can improve the rendering speed using hardware acceleration. Free users have to uncheck the hardware acceleration option in the settings. Otherwise, all the editing will be in vain, since you can only convert after upgrading to pro. To avoid this error, before doing anything on the app, open the Options menu at the top right corner of the app window. 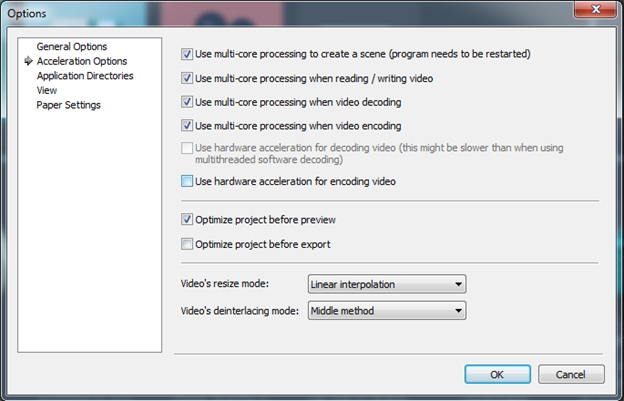 Open Acceleration Options and uncheck the box that reads Use hardware acceleration for encoding video. You have the control over the final video quality. The app supports UHD and HD output resolutions. It is one of the few free video editing software that allow H265/HEVC codec, which is high quality and maintains a small file size. 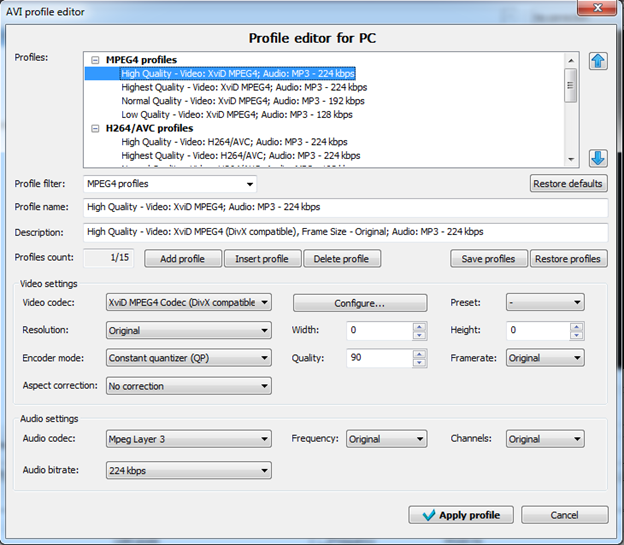 You can configure the output video to the quality you want under the profile editor. On the Export project tab, click on Edit profile (located in the bottom half of the window). On the next window, you can choose the profile and quality of output video, the profile filter, the video codec, the encoder mode, the audio codec, the frequency, and the audio bitrate. Sharing videos to popular social networks is easy. You can directly upload videos to YouTube and prepare videos for Vimeo, Facebook, Twitter, and Instagram with the correct formats and requirements, thus saving a lot of time and effort. The application has an inbuilt DVD burning tool. Therefore, you can easily burn the resulting video to a DVD. On the conversion tab, you can select where you want to save the file before clicking on Start conversion. After the conversion is finished, you can transfer the file to any device you want. This video editor supports opens all video, audio, and image formats you can think of. Also, the list of output formats is long. See the table below. With this app, you hardly ever have to worry about format compatibility. Also, you can select the media device you want to export to so that the app can convert to the compatible formats. 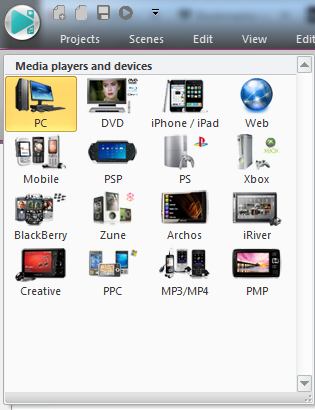 The supported media devices include PC, DVD players, iPhone/iPod/iPad, mobile phones, Sony PSP/PS, Xbox, Blackberry devices, Archos Player, Zune Player, Creative Zen media players, iRiver Player, MP3/MP4 players, Portable Media Players (PMP), and Windows Mobile PPC. 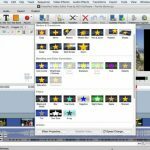 VSDC free video editor is easy to use. The interface is intuitive. You can easily open the settings, create a new project, open the editor, add objects and video effects, and export the project. Combining different videos and images can be tricky as beginner using the software. You have to click on Run Wizard to open the File’s sequence wizard. You can use drag and drop, or browse the files you need. After adding all the files and transition effects needed, click on Apply settings. The installer will install Microsoft C+++ redistributable before finishing installation. It takes less than 3 minutes. To upgrade to the pro version, you will require internet connection. Technical support is also available to pro subscribers only. However, free users can make a $10 payment to receive technical support. The website assures that you will receive feedback within three days. If you are not satisfied with the support, the money is refunded. But that is not to mean that free users of the software are left out. There are over 150 video tutorials on the YouTube channel. Additionally, there are 25 how-to guides on the website that cover everything you need to know about video editing with VSDC. They cover things like importing files, advanced settings, exporting videos, applying effects, merging videos, and removing video and image background. There is an FAQ section too. It has detailed answers to 9 of the most frequently asked questions. 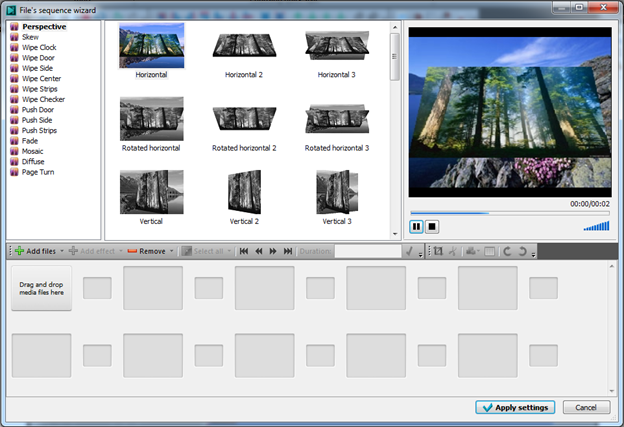 Overall, VSDC is feature-rich free video editor. Amateurs will appreciate the basic video editing features such as cutting, color blending, and adding objects. Professionals will like the advanced editing features such as subtitling, transition effects, and 3D pro charts creation. The only reason to go for the pro version (priced at $19.99) is if you feel the need to have hardware acceleration, chroma key, and audio waveform. The bottom line is that, VSDC free video editor is one of the best in its category.